During this time of year, all we think about is cozying up with a big bowl of soup for dinner. Soup is one of those near effortless meals that’s flexible enough to work with whatever ingredients you have on hand. It warms you up, and it makes for a delicious lunch the next day. This recipe came about from one of our clean-out-the-fridge experiments. And it turns out you people love soup as much as we do! After the countless requests that came streaming in, we finally got around to testing and writing up a proper recipe. So get your bowls ready: the Veggie Bean Soup with Roasted Lemon is finally here. This soup is a weeknight rockstar that packs a lot of flavor into a single bowl. 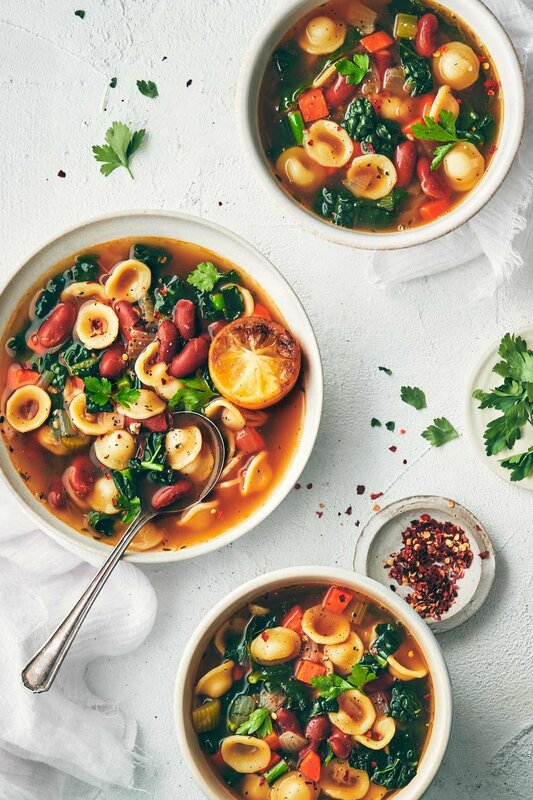 The broth is studded with garlic and thyme, it has a hint of spice from the red chili flakes, and the roasted lemon adds a bright acidity that makes this soup anything but boring. Citrus is in season during our winter months, so while we’re absolutely not craving any ice cold lemonade (brrr), we can definitely get behind warm, roasted citrus. If you’ve never roasted citrus before, now’s your time. It’s super simple: while the soup cooks, you toss some halved lemons on a baking sheet and pop them in the oven. The lemons will soften and emerge juicy and slightly caramelized. The juice’s flavor is slightly sweeter (and slightly less pucker-inducing than raw), perfect for swirling into soup. Standard veggie soups often lack enough substance to actually keep you full - and we don’t know about you, but we’re not into meals that leave us hungry a mere hour later. This Veggie Bean Soup with Roasted Lemon, on the other hand, means business. It features a combination of canned beans and pasta. Not only does this make for a quick cooking time, but they also combine to form a vegetarian/vegan-friendly complete protein. And as if that’s not enough, the vitamin C in the lemon juice helps your body absorb more nutrients (like iron) from the kale. See?! We weren’t kidding. Since this recipe cooks up relatively quickly for a soup, it is important to select a good-quality vegetable stock. The stock forms the base of this soup, so do make sure to pick a good one for optimal flavor. This is our favorite go-to vegetable stock, but pick whichever one you like best. We like the creaminess and flavor of romano beans in this recipe. They may often be sold/labelled as borlotti beans or cranberry beans. If you can’t find them, you can substitute pinto beans instead. Orecchiette noodles are awesome in this soup, because they’re the perfect balance of sturdy yet still soft. However, you could try a different type of small pasta noodle instead. Just remember that every noodle shape has a slightly different cook time, so do be sure to adjust accordingly. This soup is completely delicious on it’s own, but like most soups, can be served with whatever carb-y sides your heart desires. We’re always looking for excuses to bring home a fresh baked loaf of sourdough, so there’s no shame in the bread game. Preheat oven to broil. Place the four lemon halves face-down on the baking sheet. Roast for 20-25 minutes, or until the bottoms are golden brown on the edges. Set aside to cool. Meanwhile, heat a large pot over medium-high heat. Once hot, add oil. Add onion and saute for 4 minutes. Then add garlic, celery and carrots and saute for another 6 minutes until softened. Add 1/2 teaspoon of salt and red chili flakes to the vegetable mixture. Pour in the vegetable stock, add thyme sprigs and bay leaves. Cover with a lid and bring to a boil. Once the stock is boiling, add the orecchiette pasta to the pot. Give it a stir to distribute the noodles. Cook for 8 minutes uncovered, then add romano beans. Cook for another 4-5 minutes, or until the orecchiette noodles are el dente. Remove the woody thyme stalk and bay leaves from the soup, discard. Stir in the remaining 1/2 teaspoon of salt and sliced kale. As soon as kale is slightly wilted, remove from heat. Squeeze as many lemon halves as you need until you have 1/4 cup of juice (remove seeds, if any). Stir the juice into the soup. Taste and adjust seasonings (e.g. more salt or lemon juice, if desired). Garnish with black pepper, parsley, and extra lemon. -*We use 1/2 teaspoon of red chili flakes, but if you don’t like a bit of heat, then reduce to 1/4 teaspoon (or omit entirely). -**Can be substituted with other small pasta noodles. If gluten free, use gluten-free noodles of choice. Dry orecchiette pasta typically cooks in 13 minutes. If using another type of noodle, adjust relative cook time accordingly. -***May also be called borlotti beans or cranberry beans. If not available, substitute with pinto beans.